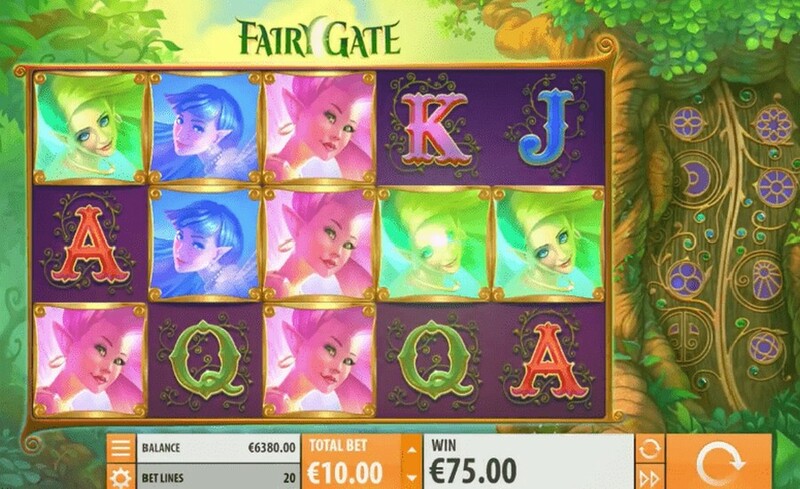 The new online slot game Fairy Gate developed by the casino games provider, Quickspin and available at real money casino VideoSlots. 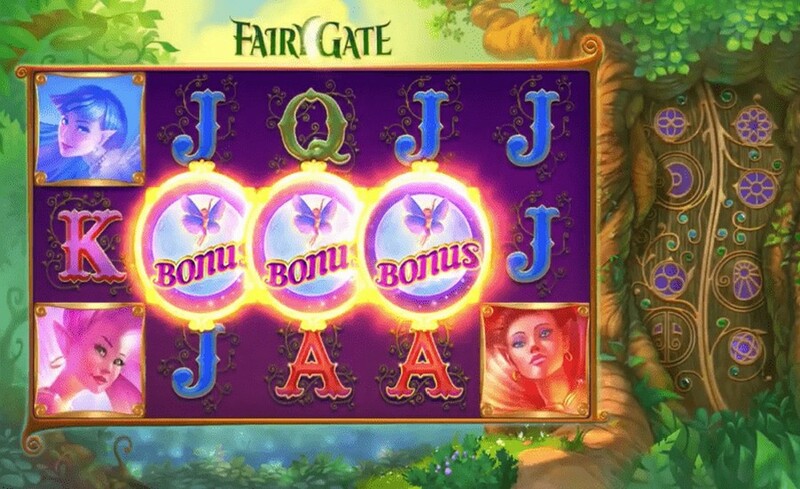 The slot machine game Fairy Gate has 5 reels and 3 rows. This video slot game is available on desktop, tablet, as well as most other mobile devices. The online slot game’s theme is all about an enchanted forest populated with numerous beautiful and magical fairies. The background shows dense vegetation, with a big old tree standing on the right hand side of the reels. The high value slots symbols on the reels, each feature a fairy, and every fairy has a unique color. So there is the green fairy, the blue fairy, the pink fairy and the red fairy as the highest paying symbol. J, Q, K, and A make up the low value symbols. Furthermore, the scatter features a big orb with the word “Bonus” on top. Moreover, the scatter only lands on reels 2, 3 and 4. In other words, the three middle reels of the main reel set. The wild symbol is a golden square with the word “wild” on top. Wilds substitute for all other symbols except the scatter. There is a big tree on the right hand side of the reels. During every spin, a gate will open inside the tree, to reveal 2 extra reels. But no symbols can land on these extra reels. Alternatively, orbs can land on each of the reels. And these orbs have fireflies inside them. When they land the orbs will bust and the fireflies will fly out and on the main reel set. Then, on whatever symbol that a firefly lands, that symbol will turn into a wild symbol. Up to 10 wilds can be added thanks to this feature. Every time an orb lands on the extra 2 reels, apart from the wilds, the player will also get 1 free re-spin. On this re-spin, the gate on the tree will remain open, so more orbs can potentially land. The re-spins will continue until no more orbs land on the extra reels. However, if the extra reels feature just blanks and no orbs, then the re-spins will end. Players can trigger the free spins feature by landing 3 scatter symbols, simultaneously, on reels 2, 3 and 4. Triggering this feature will award 10 free spins. During the free spins feature, the gate will remain open, so players can land orbs during every free spin. However, the player can not win re-spins during the free spins feature. 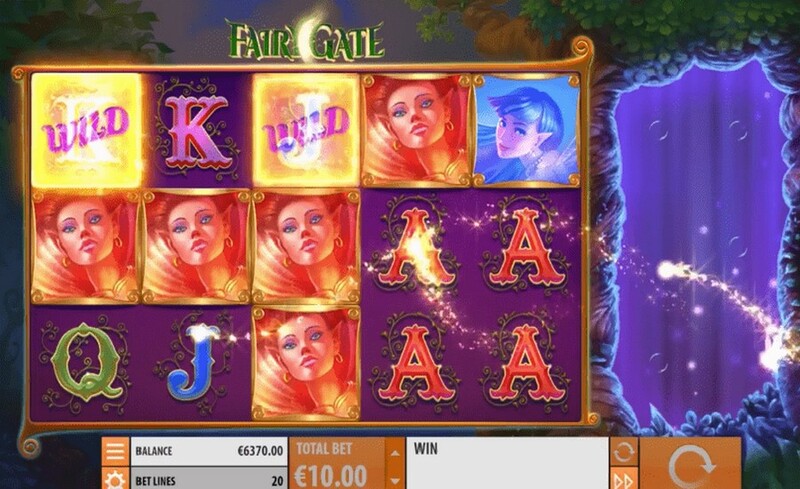 Fairy Gate is a medium low volatility online slot machine with an RTP of 96.66%. This online slot game has an excellent design with amazing graphics and cool animations. The soundtrack is also nice to listen to. The orb and re-spin features of video slot game offer a fun and pleasant experience which can also give a number of decent wins.